synopsis (EN) Dog show meets fashion show in this chance to turn an adorable puppy into a glamourous star! 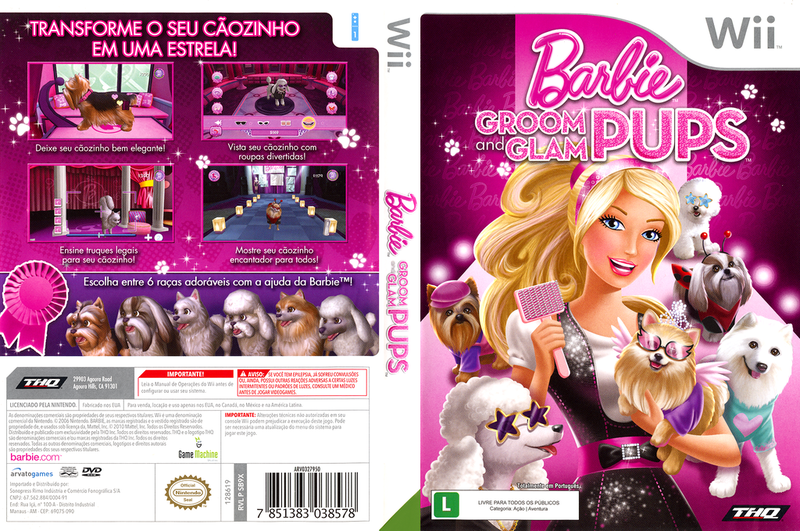 Barbie: Groom and Glam Pups gives you everything you need to make sure that, when the moment comes, your puppy will be ready to shine. Pick from six breeds, each chosen because they're high on cute factor and even higher on high-style potential. Use real grooming techniques to help your dog look her best, then add layers of style with glam clothes, costumes, and collars. Get advice from Barbie to make sure your dog is ready for the big finale - a dance sequence, a walk down the runway, and a fabulous photo shoot! synopsis (ES) Barbie cuidará y entrenará a tu perro para que sea el mejor en el Consurso final. Podrás elegir entre 6 razas de perros diferentes y desbloquear accesorios y nuevas razas de perros.